For me, deafness is a way of life. I was born hearing, and began losing my hearing as an infant. My parents couldn’t get a proper diagnosis until I was almost 2 and then I was fitted with hearing aids. My parents chose to raise me with an emphasis on spoken language, using speech therapy, hearing aids, and FM systems while being educated in the mainstream setting. My hearing loss got progressively worse and I became profoundly deaf by the time I was nine years old. At that point, relying only on auditory information started becoming more and more difficult. By fifth grade, I began learning sign language and using an interpreter, which continued through high school and college. I went to college and earned my BA in Deaf Education, Elementary Education, and Special Education. I moved to the Chicago suburbs and began began my teaching career working with deaf students who also had emotional & behavioral disorders and I learned a LOT about behavior management. At the same time, I began working in Early Intervention and became credentialed as a Developmental Therapist-Hearing (DTH). Over the years, I went back to school to get my Masters in Early Childhood Special Education and have taught in a variety of schools including residential, self contained, resource room, and itinerant services. I had the opportunity to start moving into more administrative roles in the schools as a Curriculum Coordinator, Assistant to the Principal, and am now Director of Student Support Services in a Montessori School that has an embedded Cued Speech program. I married a hearing man and together we have 4 beautiful children, all hearing. However, 2 of them have been involved in the early intervention system and have had IEPs in the mainstream setting. I feel like I’ve come full circle in my life in that I’ve experienced all educational settings and communication modalities, whether professionally or personally. I also feel like I’ve been on all sides of the table at the IEP, as a student, parent, teacher, advocate, and administrator. My personal and professional experiences lead me to the point that I most often emphasize when I work with families of deaf children….when your needs change, your choices can change too! Too often, people get stuck on one way to do things. If something isn’t working, why not explore something new? If something is working, why not add something new? Because I can talk, sign, and cue, I have met so many people and have had my life enriched in so many ways. 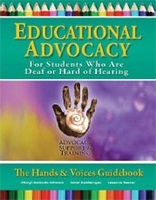 I am able to be a part of the hearing world, deaf community and the Cued Speech community. There is no one size fits all. There never has been! What works for the family is what works for you. Keep an open mind and be willing to explore sign language, ASL, oral, and Cued Speech options! This entry was posted on Saturday, June 20th, 2015 at 6:31 pm	and is filed under Deaf & HH Adults. You can follow any responses to this entry through the RSS 2.0 feed. You can leave a response, or trackback from your own site. You can see your passion for the deaf community in this great article! I’m involved with the deaf community and love the work I do. What has been some of your favorite experiences?